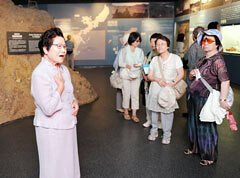 On May 28, at the Himeyuri Peace Museum in Itoman, Museum Director Yoshiko Shimabukuro (left) told visitors about her experiences during the war. From the end of September, the Himeyuri Peace Museum will end its program of sending out Himeyuri Student Corps survivors, who lived through the Battle of Okinawa, as lecturers for students on school trips. Since opening in 1989, the museum located in Itoman has educated many people about the misery of war. Lectures outside the museum are mainly held at visiting students’ places of accommodation, and often run past 10:00 p.m. Staff and family members of the speakers, who are now aged between 84 and 88, have voiced concerns about their health and safety. After much discussions starting last year, on March 18, 2013, the end of this program was officially communicated to travel agencies and other related organizations. The museum had 27 lecturers when it first opened, but this number has decreased to ten due to death and illness. At the same time, the frequency of speeches per person has increased. According to the museum, the number of lecturing appointments, including talking to individuals, exceeded one thousand each year. On average, each lecturer gives almost 100 lectures annually. Some days one person may have to give as many as three lectures. Of the 615 appointments received by the office in 2012, outside lectures accounted for about half of them.